Every Sunday we gather around the Jesus Story at 10am (85 Gillies St, Fairfield). We are a welcoming and diverse group. 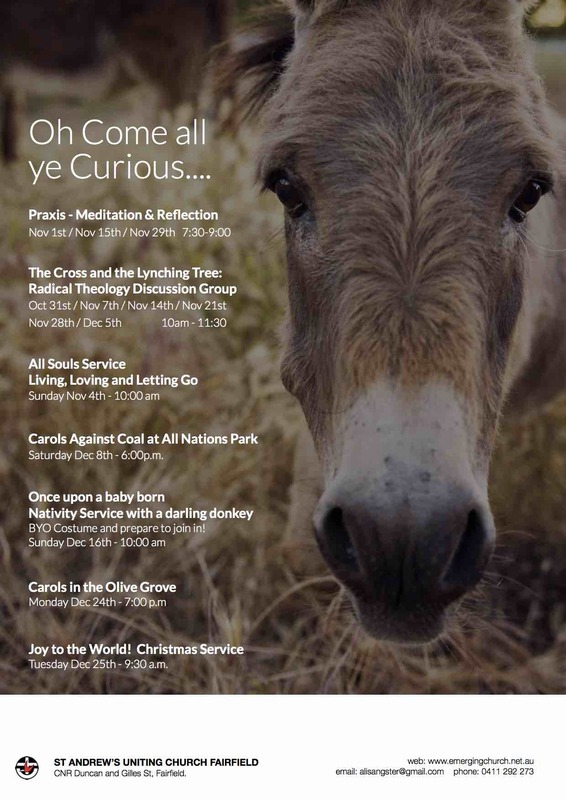 We also hold a lot of other community events, especially during advent as we prepare to celebrate the birth of the Christ child. Please see below for these. If you're not sure about the structure of traditional Sunday workshop, then come along to Praxis. 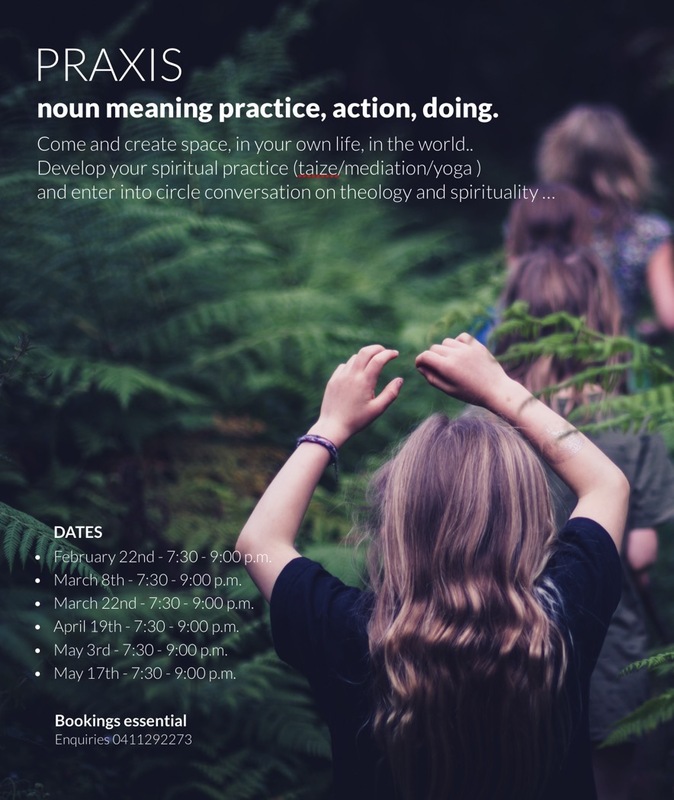 Spiritual Praxis is about connecting to ourselves, each other and God through poetry, meditation and being in community. It will be held on Thursdays in November (Nov 1st, Nov 15th, Nov 29th). For more details please contact Rev Sangster at alisangster@gmail.com. 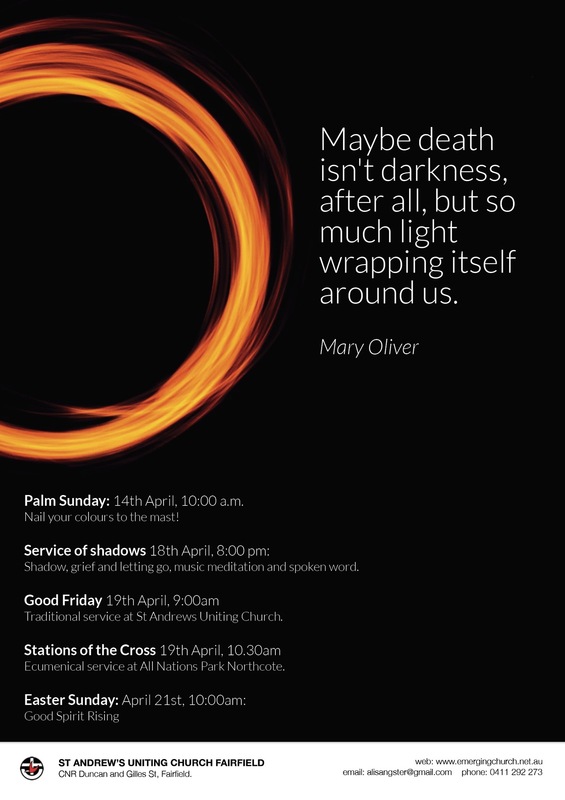 Join us this Easter season as we walk the journey towards the cross. Every other week we have a focused program for our youth around high school age (grade 7 - 12) to offer support and guidance on their faith journeys. We hope to create a nourishing and inclusive community where our youth can honestly probe the big questions around God, faith, being and more. Please contact Angela with any questions about this group 0432 179 396. Dates for 2018 are below. Lucy Neville is our wonderful children's minister and is here every week. Anna is is a circus performer and improv theatre artist. She encourages and supports our young people to play and explore their spiritual journeys through drama, improvisation and art. Several young people from our church attend Brunswick Uniting Church's youth group, which runs fortnightly on Friday nights. It's a fun and relaxed event for our youth to develop inclusive and accepting community. Youth Group (YUCY) is held in the hall just beside Brunswick Uniting church, at 212 Sydney Road, Brunswick. They generally ask for $5 donation to help with purchasing craft materials, games and snacks. 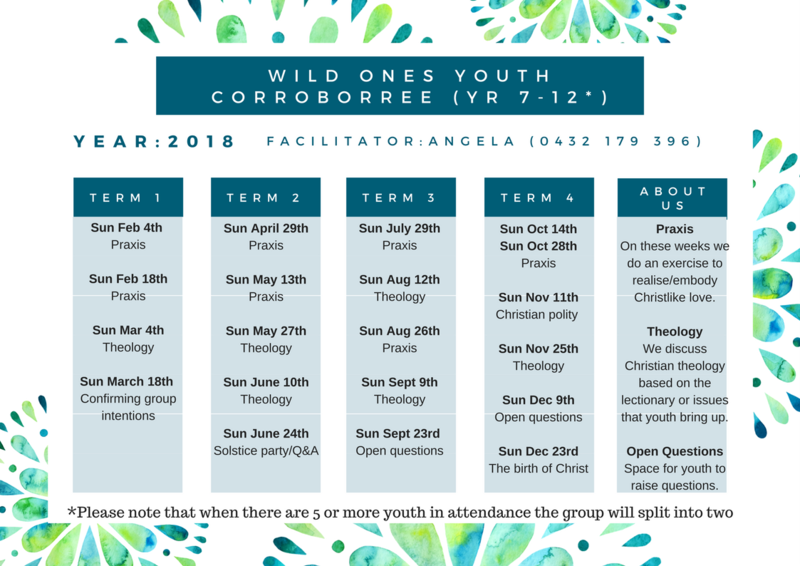 For more information contact Janet at janethogan90@gmail.com or Fairfield Uniting Church youth worker Angela at amerriam@gmail.com. 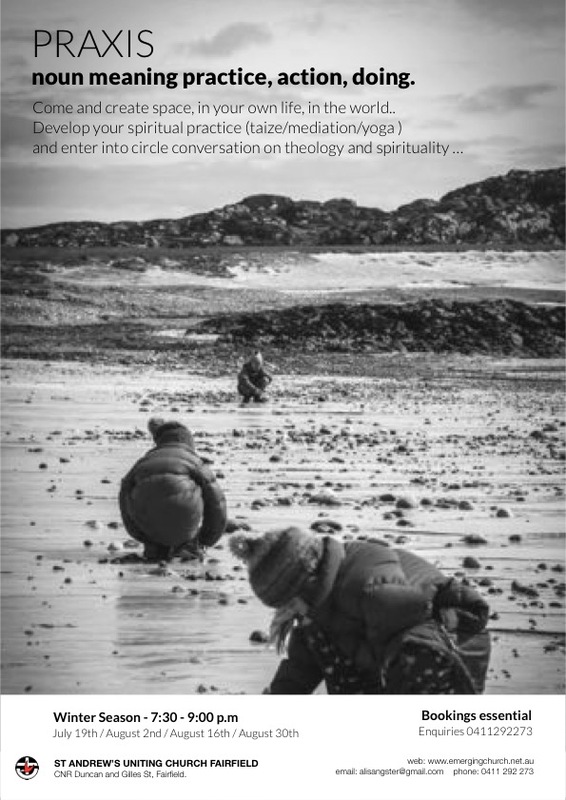 Every other Thursday throughout winter we're offering an evening inviting the community to explore spiritual Praxis. If you would like to connect with us but not sure if you'd be comfortable actually attending Sunday morning services, this is a great place to start. We'll connect to ourselves, each other, the divine, through poetry, meditation and exploring spiritual Praxis in community. 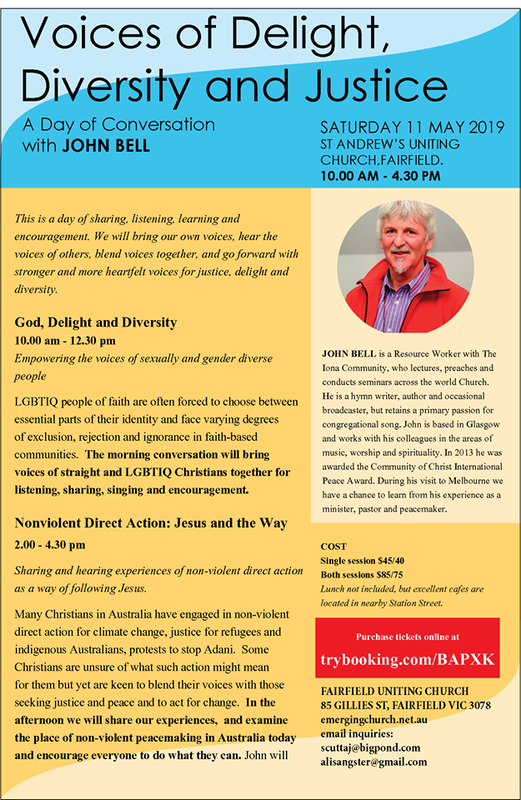 All Praxis sessions held here at St Andrews Uniting Church. Please RSVP at 0411 292 273 or email Ali at alisangster@gmail.com for information on topics or if there is preparatory material. 6 Week Fairifield Course with Ilka White. Hope, Helen, Ernie reveal some of their musical backgrounds by playing solos of their composed pieces or favorite Klezmer, Hungarian, Celtic, Blues tunes or songs. Come and create space, in your own life, in the world..
February 22nd - 7:30 - 9:00 p.m.
March 8th - 7:30 - 9:00 p.m.
March 22nd - 7:30 - 9:00 p.m.
April 19th - 7:30 - 9:00 p.m.
May 3rd - 7:30 - 9:00 p.m.
May 17th - 7:30 - 9:00 p.m.